Google Thewallinna and other creatures: Sewing with leather: first attempt. After two days of thinking, twenty minutes of drafting, one hour and one broken needle, I produced this bag. I always knew I needed more sparkles in my life - hey, who doesn't need sparkles? So when I joined a blogger meet-up in London two weeks ago and saw these two sparkly pieces of leather in a shop, I bought them immediately. If you are an animal rights activist, you can stop reading here! If, like me, you are interested to discover working with this material, read on! This was the very first time for me to sew with leather and it was scary. But we all have to start somewhere! Initially, the inspiration came from browsing online but then I started thinking about everything I like and need in a bag. Besides being pretty, I like big bags where I can carry many things: laptop, camera, Kindle, notebook, bottle of water or thermos with coffee, a pair of dancing shoes and many other little things. After that, I looked at my old bag and evaluated its pros and cons, and I came up with a pattern. Basically, there are two rectangles, one of which has rounded edges. Since this was my first time sewing with leather, I realized that it would be more difficult to work the corners. 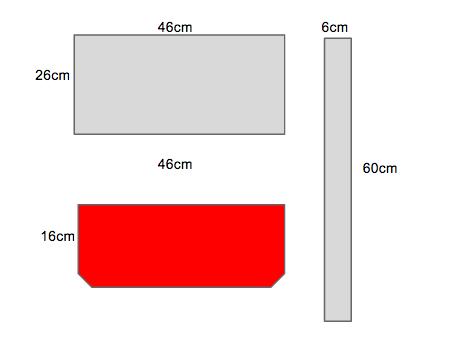 When I finished drafting my two rectangles, I also added 0.5cm of seam allowance as well as a strap. Once the pieces were cut, I sewed them together as if they were fabric, right sides together. Different sources on the Internet suggested two methods of handling the seams: either by topstitching or, if you don't want the stitches to show on the outside, by gluing them. In my case, the 0.5cm seam allowances don't bother me at all, so I left them as they were. When sewing straps, I folded each one twice lengthwise, creating three layers of leather (the final strap is 2cm in width). Since I made the bag, I've being carrying tons of heavy things including my laptop with charger, groceries and fabric (did I say fabric?) and the seams have not split. Fancy stitching for the straps! I am a bit concerned about the aesthetic look of the straps where they are attached to the bag. You can see from the photos that, at first, I stitched all the way along the strap and then, to attach each strap to the bag, I stitched rectangles . Do you know any other method to stitching straps to the bag! Having made this bag, I'd like to share some points to consider when sewing with leather. Do not use regular pins because they leave holes, but quilting pins. You can use regular polyester thread. Use a special leather needle. I wanted to disregard this advice myself, but ended up with a broken needle after 20 seconds. Sew with tracing paper on top of the leather to avoid the pieces from shifting. I made a few stitches without paper and had to rip the seam and re-stitch it again. If you leather is very thin, you can iron it! I adjusted the heat of my iron to 'Wool' (low heat) and had absolutely no problem ironing my leather. Besides that, have anyone of you worked with leather before? Are there more tricks and tips you can share to help me improve for the next project? Fantastic bag for your first attempt. I made a couple of bags and only 1 leather one and for my straps I used glue and folded the leather to the middle, like you do for a belt loop and then edge stitched both sides of the strap. This then gave me the opportunity to stitch through this stitching when attaching the straps to the bag and then adding another rectangle in the middle. Thanks for the tips! I have some pieces of leather and faux-leather and I'm planning on making maybe a bag and a skirt. I also read that you can put cello tape on your foot so it doesn't stitck to the fabric and shift. I've never worked with leather, I think I felt intimidated by it! As for attaching the straps, maybe instead of sewing them on (or maybe as an addition) you could use metal studs or however they're called... I can see them on the shop bought bags. Did you consider any way to close your bag? Zipper would be difficult to add but maybe something else to secure your wallet, ect. Rubber cement is a nice way to 'baste' seams without creating extra holes. It doesn't damage the leather and can easily be rubbed off when it dries. The sewing machines we use have a special rolling foot for an even feed, but I heard you can use a teflon foot on a regular sewing machine to avoid shifting. Instead of pressing seams you can hammer them flat, just make sure the hammer is either rounded or covered in rubber. When you're dealing with loads of layers and bulk it can help to skive the seam allowances (thinning the leather there by removing a strip from the wrong side). However, this isn't that easy (it took me a few hours to get the hang of it) and it's done with a specific knife on a smooth granite surface. It's a bit like grading a bulky seam! Think you have a winner there. Love your bag! I've taken Don Moran's leather bag class on Craftsy.com and he does an excellent job talking you through the different leather weights and how to work with leather. I originally found him on his old bog site Weekend Designer (http://wkdesigner.wordpress.com/) which has some truly AWESOME resources. He now blogs at Bag-n-telle (http://bagntell.wordpress.com/). I recently pulled off the Weekend Designer site how to draft your own blue jeans. Haven't tried them yet, though. Gorgeous bag! I love bags that can actually carry stuff. I've been working on a wallet and drooling over http://after-the-denim.blogspot.com/2013/04/how-kelly-bag-is-made-at-hermes-atelier.html. Maybe someday ill attempt that! It's amazing how many common useful skills have been lost recently. 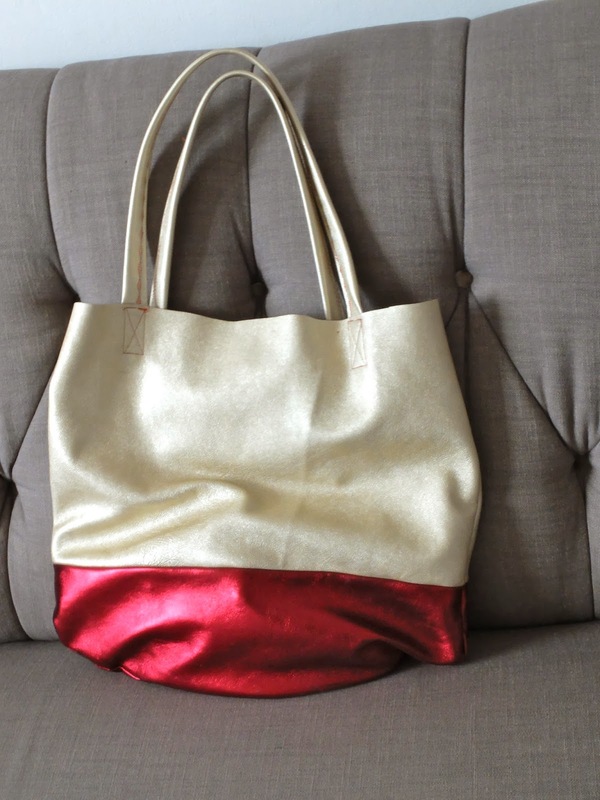 Now to have the perfect bag, you have to learn to make it! Beautiful work! Congratulations on a new skill! Thank you for the post and the bag is super cute! I have been trying to work up the courage to make a tote of dark leather and am inspired! As a animal lover who despises synthetics, I buy old clothing from thrift stores. The leather for my bag is from a 1980's leather coat I picked up for $10. I don't feel bad and the charity makes money from the sale. Love your posts! Wow, a new leather bag - I'm inspired! I don't usually like bag making but love this straightforward design paired with exciting fabric. great tips! I have sewn pleather before, and ended up with many broken needles. I was trying to make the computer bag - it is still in my "to-finish" pile! 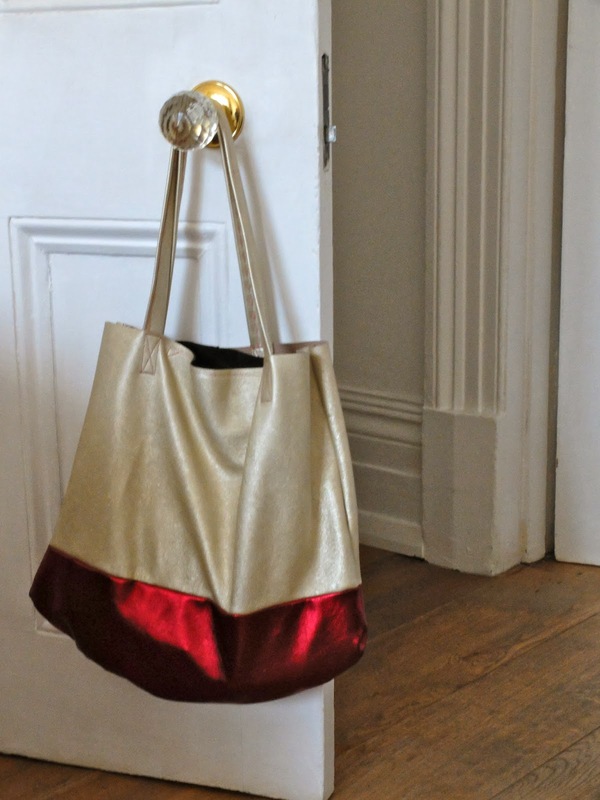 Your tote looks great. I love bags!! Thanks for the tip, Sharon! I'll try this one next time! Thanks for the suggestion, Joanna! I thought about rivets too, but I did not want to invest into more material because not only you have to buy rivets but additional tools like hammer etc. WOW! So many useful tips! I will definitely give some of them a go next time. Shoemaking class makes me dream! Looking forward to read about it on your blog soon! ooohhh my goodness I love sparkly leather! I have something similar in mind...but I think that I´m going to sew a backpack in leather, thanks for all your tips!!!! I've also seen people use paper clips instead of pins, so you definitely don't make holes! I have been experimenting with leather sewing too. I bought a leather skirt at a thrift store to make a zippered clutch bag. Also bought a suede coat to do the same. Oh! Thanks for sharing! He is truly inspiring creator! I love the sparkly leather and the colours are so nice. Great job on your first leather bag, I'm sure you'll get loads of use from it. Thanks, Gabrielle! It was really easy! Oh wow! Did you succeed? Do you have photos? I'd like to see! I wish you were there too! If you come next time, I'll show you the shop where I bought it. I really like this bag. I have to mention the stitching as well is nice. overall lovely product. Thanks for the tips! I've never used leather in sewing before. It's a really great bag!